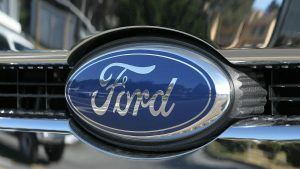 Ford Motor Company (NYSE:F) chief executive Mark Fields has announced that the company has canceled its plans to open a factory in Mexico, preferring to add that work to a plant in Flat Rock, Mich. Ford previously said it would move small car production from the U.S. into that new factory. The announcement was made by senior Ford executives at a suburban Detroit assembly plant. However, Fields gave a different reason for canceling the $1.6 billion factory slated for San Luis Potosi. He said, “The reason that we are not building the new plant, the primary reason, is just demand has gone down for small cars.” According to Joe Hinrichs, Ford’s President of the Americas, the “net savings” of the new plan come to around $500 million. Ford will use some of the savings from the planned Mexican plant to expand its factory in Flat Rock. Adding the work intended for the new plant to the Michigan plant would create 700 more local jobs in the area. The workers will build mostly self-driving and electric cars, including a hybrid Mustang. The company would not comment on the specifics of the 700 new positions. The new jobs will probably require computer literacy and more than a high school degree. The move aligns with Ford’s long-term goals. The company aims to invest $4.5 billion in electric vehicles by 2020. The Ford engineers tasked with creating the new electric models work in Dearborn, Mich., only 20 miles from the Flat Rock assembly plant. Moving production to Mexico would have made their jobs harder. It’s also easier for companies to find skilled workers in the United States. Ford will continue to make gasoline-powered Focus vehicles at its Hermosillo, Mexico, plant. Moving the small car production to Hermosillo means that the plant will now operate near capacity. It will also save substantially on labor costs compared to what it paid union workers to produce the Focus. The Wayne Assembly Plant where the Focus and C-Max are currently built is being converted to build higher-volume, higher-profit light trucks.